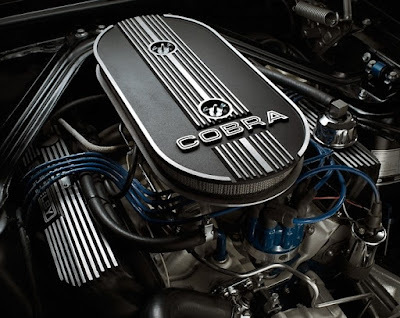 It is similar to the Green Hornet Shelby GT500, this Shelby Black Hornet is powered by Cobra Jet 428 V8 engine producing 335 hp and comes with Edelbrook aluminum heads, a top-loader 4-speed transmission, power steering, power brakes, and Shelby 10-spoke wheels. The 'Black Hornet' Mustang pays tribute to another one-off Mustang, the Shelby Green Hornet which served as a rolling test mule for new technologies like electronic fuel injection, independant rear suspension, power antenna and four wheel disc brakes. 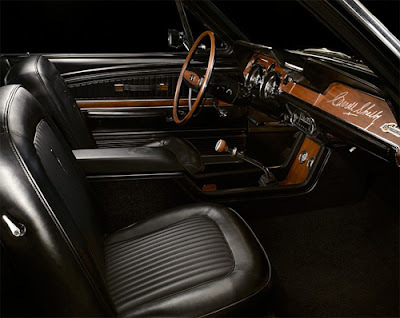 The Shelby Black Hornet Mustang was built by Barry Smith, owner of Legendary G.T. as a continuation Shelby EXP500 under a license from Carroll Shelby Licensing. Barry used an original 1968 Mustang which he painted 'Stetson Black' in honor of the hat worn by Carroll Shelby. The Black Hornet is identical to the Green Hornet just after it received disc brakes but prior to the EFI or independent rear suspension. The car has been owned since 2003 by Mr. Shelby and includes a myriad of custom parts which can be seen below.